Cramond Island is a tidal island in the Firth of Forth reached at low tide by a causeway which extends for just over ¾ of a mile into the river from the village of Cramond. There is a noticeboard at the landward end of the causeway setting out the times when it may safely be crossed. Take note, and make sure you allow yourself the time you need to explore an island that turns out to be larger than it looks, and the time to get back along the causeway before the waters close over it. This may sounds like an unnecessary warning, but it is quite common for visitors to become stranded on the island by the incoming tide. Cramond Island is just over a third of a mile long, and rather less than that wide, and covers an area of 7.7 hectares or 19 acres above the high tide mark. At its centre it rises to a height of 68ft above sea level and offers extensive views east to Granton and Leith; west to North Queensferry and the Forth Rail Bridge; and north to the other small islands in the Firth of Forth and the coast of Fife. The island is owned by the Dalmeny Estate. 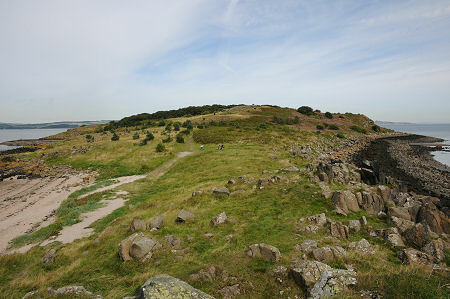 Cramond Island is uninhabited, though there is ample evidence here of the hand of man. The island is believed to have been used during the Romans' periods of building at Cramond, though nothing has been found to confirm this. The suggestion seems to be based mainly on the supposition that it would be odd for the Romans to build an important fort and harbour at Cramond and not also establish some sort of presence on the island. By the 1800s Cramond Island was being used to graze sheep, and the 1853 Ordnance Survey maps shows a farmstead towards the northern end of the island. Traces of this can still be found under a heavy growth of ivy. In later life the farmstead was used as a holiday home. On the west coast of the island are the remains of a stone jetty which could date back to the 1800s, or to a much earlier date. Nearby is the ruin of the Duck House. This tiny building was used as a holiday let and, though it is difficult to believe today, could accommodate four people. World War I saw the northern end of the island taken over by the War Department as part of the defences of the Firth of Forth. This part of Cramond Island was returned to its civilian owners in 1926, but on the outbreak of World War II the entire island was requisitioned. The extensive construction works that were then carried out account for most of the structures still standing on the island today. As you approach Cramond Island along the causeway, the most obvious military defences are in the form of an emplacement for a 75mm gun intended to guard the gap between the island on the south shore of the Firth of Forth, plus a nearby housing for the searchlight intended to illuminate targets for the gun. Actually, though it is not obvious, the imposing concrete teeth alongside the length of the causeway are also military in origin, intended to ensure that small surface craft or U-Boats could not pass south of the island at high tide. The north eastern corner of the island groans under the weight of much more wartime concrete. Here you can find a range of gun emplacements, buildings for anti-shipping searchlights, the terminus for the anti-submarine net which would have stretched right across the river, stores, and engine rooms intended to provide power for the island. Less has remained of the barracks which once housed the troops manning the installations. Presumably they were more lightly constructed and therefore easier to remove when the war was over. The north end of the island is the closest you are likely to come to the island of Inchmickery, a smaller island nearer the centre of the Firth of Forth. This is a little over a mile away, but you can see that Inchmickery seems almost entirely covered by wartime concrete, making the defences still evident on Cramond Island appear modest in comparison. 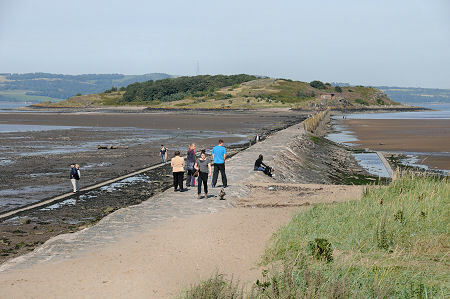 Cramond Island is a fascinating place, and also a very popular one. The island offers a touch of wilderness almost on Edinburgh's doorstep: though the liberal application of graffiti to most standing structures and remains of camp fires suggest it is not as respected by all its visitors as might be hoped. Access: Access is tidal: take heed of the information posted at the landward end of the causeway.